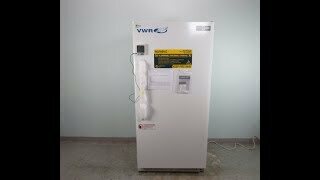 The VWR Series Flammable Storage Refrigerator offers reliable and safe storage of volatile and flammable materials for use in your laboratory. This upright specialty purpose lab refrigerator has a 20-cu ft volume with fixed interior shelves, 1 adjustable shelf, plenty of in-door storage space, and includes a probe access port for monitoring equipment. All electronic components are located externally, and the compressor is sealed in a vapor proof enclosure. This VWR Series refrigerator has an adjustable temperature range of between 1-10°C, with a cycle defrost, and a 1/3 hp compressor. This flammable storage lab refrigerator also features a lockable door for added security and is designed top to bottom to meet NFPA and OSHA guidelines 45 and 70. This VWR Flammable Storage 4°C Lab Refrigerator is a brand new scratch & dent model, please note there is a significant dent at the rear of the refrigerator (pictured) however this unit has been fully tested by our service department and has a clean bill of health. Performance is not impacted. All of our lab equipment comes backed with our standard warranty. Should you have any questions, please don't hesitate to contact us.